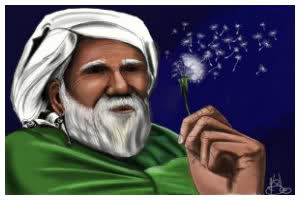 Once upon a time Khidr, the teacher of Moses, called upon mankind with a warning. At a certain date, he said, all the water in the world which had not been specially hoarded, would disappear. It would then be renewed, with different water, which would drive men (generic) mad. When you were young, an adolescent, a teenager, or a young, middle-age or mature adult, has anyone ever said your thoughts, beliefs or ideas were “crazy” or “insane?” Have you ever said as much about another’s thoughts, beliefs or ideas? Do you ever sacrifice or deny your True and Authentic Self, your values or your principles in order to “fit in,” or to be liked, acknowledged or loved by someone else? Do you ever go along to get along? Do you ever engage in collusion? If so, why? Have you experienced “changed waters” in your life at work, at home, at play or in your relationship? What was that like for you? What’s it like living among the “crazy” or “insane” without becoming “crazy” or “insane” yourself? How do you deal with peer pressure? With change? Do you generally go about your days drinking your own water? What’s that like? Do you learn from past experiences? How so? How do you avoid real or potential upset in your life? Do you ever cut yourself off from others? How so? What does that get you? Many of us spend enormous amounts of time, energy and effort trying to convince ourselves and others we are big fish in small ponds or even bigger fish in larger ponds. The reality? Most of us are little fish in little ponds. How so? Most of us navigate our lives swimming around in little ponds – defined by our immediate circumstances and our immediate identity. Many of us have little to no idea what it’s like to see beyond our rational mind, our immediate thoughts, or our long-held beliefs. Most often, we are unable to even consider the possibility of there being another “reality” or “pond” out there. The reason we never venture out to see if there is a larger pond is because (1) We feel content, secure and in control in our little pond (i.e., at least we think we are), (2) We’re afraid to look beyond the edges of our little pond; we swim around preoccupied and obsessed trying to make our “pond” work for us – being intimidated by the unknown “ponds” out there, or (3) we have no interest in exploring other ponds. Most folks fall into reason number two, living in fear of the unknown and the related feelings of aloneness, abandonment and separation from what gives them a (false) sense of security. This false security is accompanied by a lack of trust and faith in even considering swimming in another pond. So, in our small pond, we struggle to create a life of security, order, control and perfection. We swim to exhaustion while experiencing greater and greater stress, anxiety, and insecurity, trying to maintain greater and greater control. What would it be like to venture into a different pond? To venture into a reality where we would give up the need to control, to give up the safe boundaries of our familiar pond, to surrender, to trust, to experience a new pond in a new way – i.e., accept new ways of do-ing and being, maybe even new ways of swimming without any preconceived notions of “pond-ness” – just jumping in and swimming? What would happen if we were to leave behind our life preservers – our ego, beliefs, preconceptions, “stories” and judgments and swim with faith, trust and surrender? What would it take to enter into a “new pond experience” at work, at home, at play or in our relationship? What would it be like to move into a new pond with an open mind and an open heart, without needing to control? What would it be like to swim in this new pond trusting that we won’t drown or lose our way? The deal is we can’t think our way into this new pond. We have to take a deep breath, let go and dive in without a life jacket, without resistance – i.e. without our familiar and habitual ways of thinking, acting, judging, doubting, or medicating ourselves in order to feel safe and secure. Swimming with this new awareness, we are present in the immediate moment, not judging, not thinking and not reacting – just present and aware. Awareness fosters inner peace, well being, alertness and clarity. We are swimming without thinking, without our customary beliefs and thoughts. In our new pond, we swim into familiar and new experiences with a sense of openness, kindness, service, compassion and curiosity. In this new pond, we are transformed; we seem to swim free of anxiety, depression, unhappiness, dissatisfaction, loneliness or deep sadness and longing. In our new pond, we swim with strength, courage, power, contentment, joy and possibility. As the shark needs to continue swimming in order to breathe and access oxygen, in our new pond and everyday activities, we must choose to remain present, authentic, and access our heart and soul – providing the “spiritual oxygen” that keeps us optimally alive, conscious, and alert. If so, the first step is to explore your little fish in your little pond, taking stock of your habits, “stories,” beliefs, addictions (chemical and non-chemical), and self-limiting and sabotaging thoughts that keep your little fish depressed, suppressed and repressed. What is your little fish attached to, obsessive about, and driven by? What drives your little fish to want power, control, recognition and security? Once you uncover what drives your little fish, and choose to let go of your ego needs to control and possess, your little fish begins to transform and morph into a trusting, surrendering allowing fish that is ready to swim in another pond. Swimming, now powered by our heart and soul, we begin to build trust and faith that in every moment, we are guided to move in the right direction. We are more able to swim with other fish from a place, not of competition, envy or resentment, but a place of service, with an attitude of kindness and respect. We experience greater moments of synchronicity and connection with others. In this new pond, our sense of identity comes from a deeper place, not the place of our limited mind and ego. The new pond of clear water at work, at home, at play and in relationship is still, quiet, peaceful and relaxed – in mind, in body and in breath. Here, we are awake and vigilant as we swim. We are open to new experiences, higher awareness, and the support of our heart and soul. We are mentally and emotionally at peace. In this new place, there is no bigger pond, no better pond – just one pond. In this new place, we swim in the stillness of the moment, with our breath – free from the hustle and bustle of activities and the nagging of our rational mind. In this new place we transcend time and space while being present in time and space. Do you always compete with the other fish in your pond? How so? 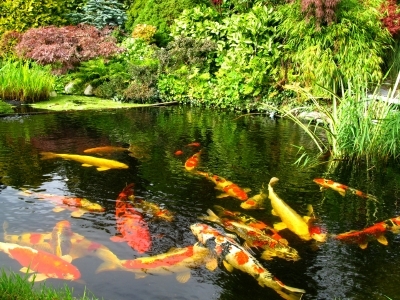 Are you peaceful and content in your pond or are you always searching for a bigger pond? Do you need “chemicals” to keep your pond healthy? How would you describe life in your pond? 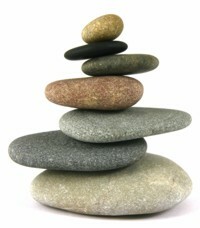 Balanced, peaceful and harmonious or stressful, rough and stormy? Are you constantly searching for bait or being baited? What’s that like? Is your pond inundated with pond scum? Who or what accounts for this? How can you clean your pond to make it sustainable and life affirming? For example, a committed relationship is one in which your behavior demonstrates commitment in an operational and observable way, one in which your thoughts and beliefs about the relationship are consistent, and in alignment with, the notion of commitment. So, if you say you’re in a committed relationship but never have time for your partner, that is not commitment. If you spend 95% of your time with your partner but are consistently wishing or wanting to be elsewhere, not sure if the relationship is the right one, or fantasizing being with another person or persons, that is not commitment. Harmony is a state in which there’s congruence between what you say, feel, think and do. When one or more of these four elements is not in alignment with the others, you won’t experience harmony. Instead, you’ll experience a feeling of imbalance that results in little real happiness, meaning or purposefulness. In a state of imbalance, you move drone-like though life – at work, at home, at play and in relationships. Committing – making the conscious choice to commit, engage and participate. The path to happiness is paved with commitment. No commitment, no happiness. Perhaps a faux happiness, the appearance of happiness, but not the real, authentic thing. Instead, you’re always looking for more and for “the next best thing,” or person. They have probably never sat down and reflected on their deeper life requirements or the core values underneath these requirements. More likely, what they have done (beginning in childhood) is come up with a list of work-life-play requirements based on someone else’s beliefs of what’s right, necessary or important. As a result, they have become indoctrinated with other peoples’ beliefs about what’s important. Consider those who consistently say they’re unhappy – at work, at home, or in their relationships. What’s most often lacking is commitment. At the same time, they have never taken the time and energy to consciously explore inside and ask themselves what they really, really want. Rather, they blindly followed someone else’s vision or goal. It’s no wonder they cannot experience commitment. Many of those who have never really explored commitment in a meaningful way share some distinctive characteristics. They lack of clarity about their life purpose, their core values or the place of spirituality in their life. They have a consistent tendency to look outside themselves for life’s “answers.” They have a limited ability for self-reflection. They lack clarity about who they are. They go through life experiencing a low-grade-fever type of state where they experience frustration, agitation, unhappiness and discontent on a regular basis. How committed are you with your activities during your day – at work, at home and in relationships? With respect to your career, your relationships, your health and your happiness, how committed are you and how indifferent are you? How might others feel about your levels of commitment? Do you ever emotionally, verbally or physically bully or manipulate others because you are committed against something? Do you find yourself denying and procrastinating because you’re not 100% committed to someone or something? Do you ever doubt the value of your commitments? If so, when? How so? Are you afraid to let go of that to which you are not committed? Why do you hang on? When was the last time you took time to seriously reflect on who you are, what you want in life or why you may be feeling uncommitted to someone or something? How do you know your values are your values and not someone else’s? Do you ever “go along to get along” when you know that it’s bad for you? Why?